Sitting in a tailback on a motorway is no one's idea of fun. Sat nose to tail with no chance of escape, there is nothing to do but twiddle your thumbs and hope that the obstruction ahead is cleared quickly. For some more impatient drivers, the hard shoulder is a quick route out of the tedium, and they will flout the law and risk a collision by ducking into this emergency lane in a bid to save a few minutes. One driver had clearly had enough of this reckless behaviour during a recent tailback on the M1, when he was filmed getting out of his car and calling fellow motorists out on their poor driving. The unidentified man was stuck in traffic between junctions nine and 10 near Luton for around three hours when he lost patience with other drivers attempting to use the hard shoulder to jump the queue. He can be heard shouting "What are you doing you w****rs, this is the hard shoulder," as he attempts to block the path of the cars. 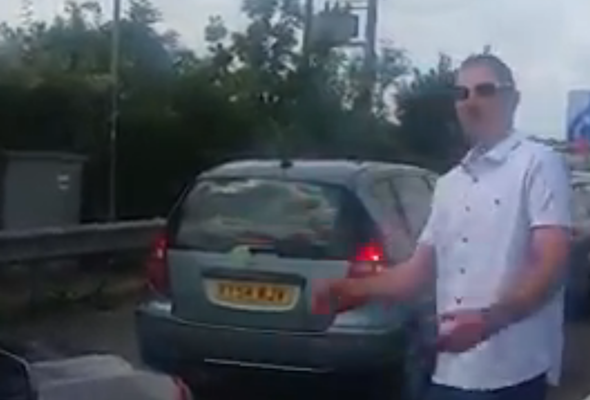 "I want to go that way as well, but I'm not, because it's the hard shoulder, you f***ing p***ks," he continues. The episode was filmed by fellow driver Dan Conroy, who told The Mirror: "It got to a point when a fellow driver had simply had enough and decided to try and humiliate those who took it upon themselves to use the hard shoulder. "He was pretty angry and there was liberal use of the 'W' word throughout his rant. "I think about 40 cars shot past him before he decided to get out of his car, so tensions were running high, as it had been happening for a while. "I'm not sure whether his rant was very effective, but he definitely embarrassed them, and probably himself, that's for sure."